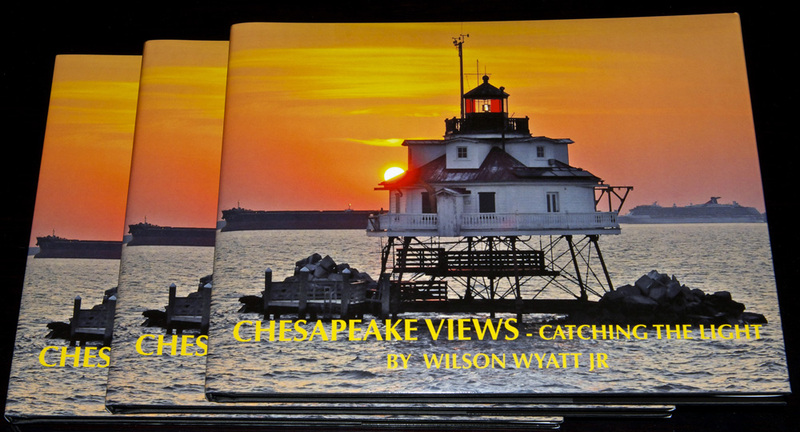 Chesapeake Views–Catching the Light, by photographer and writer Wilson Wyatt, Jr., has been published as a premium quality book of regional color photography. Offered for collectors and photography enthusiasts, the author provides details on how many of the images were taken. His collection features the northern Chesapeake Bay region, from Annapolis on the western shore, around the top of the bay, and across the Eastern Shore on the Delmarva Peninsula. For interested aspiring photographers, Wyatt lists photographic equipment he uses, as well as camera settings and lighting conditions for many of the images. The images are printed directly from original digital files on photo-quality archival paper with a high gloss UV coating to preserve color and detail. Sixty-eight pages long, the hardback book measures 11 ¼ by 8 ¾ inches, a suitable size for tabletop viewing. Wyatt will present the book at a book signing on October 26 at The Writer’s Center, in Bethesda, Maryland, and from 11 a.m. to 1 p.m., on Saturday, November 9, at the News Center, in Easton, Maryland. It will be available at Talbot County libraries, some regional bookstores, and directly from the author. Wilson Wyatt’s photography has been published in newspapers, magazines, and commercial media. He has exhibited his work in juried photography shows and art galleries in Scottsdale, Arizona, Maryland, and online. His first book of fine art photography, Yosemite–Catching the Light, was published in 2011 as a limited edition. To order the book (at $65 postpaid), contact the author by email at wwwyatt2@gmail.com, or by mail at: P.O. Box 298, Bozman, MD 21612. Original color prints of images in the book are also available for special order directly from the photographer. Contact him by e-mail (above). What a pleasure! Thank you Sandra. I appreciate the new book review, in Bay Weekly, and thank you to the reviewer, Robert de Gast, as well.